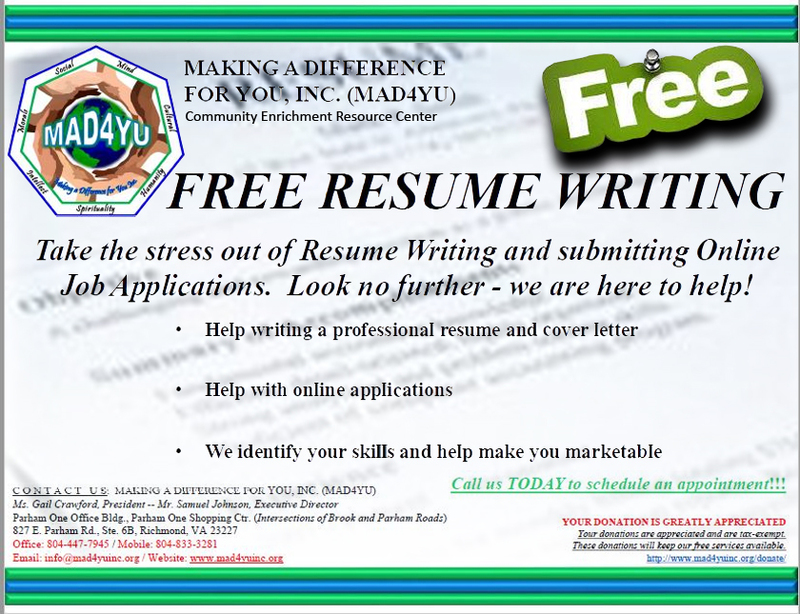 Resume Preparation – Making A Difference For You, Inc.
Why Should the employer hire you? Don’t forget, your employment search is also an opportunity for you to see what your value is in your career field and an opportunity for you to evaluate other employers in the market for great people to hire. Whether you are looking to begin or advance your career, don’t forget that you have value! an up-to-date resume, a cover letter for some jobs, your employment history, and your schedule of availability to work if you’re applying for a part-time job. In addition, as part of the job application process, you may need to take an online employment test and provide employment references. To get the assistance you need, all you have to do is call our offices and make an appointment during normal business hours or leave a message. sessions are 1 hour to 1-1/2 hour. Your kind and generous donations are appreciated and will help keep our FREE services available. Any donations are tax exempt.